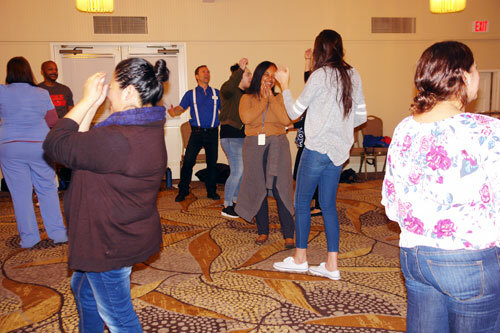 Strengthen your team communication while developing a greater sense of community in your staff…all through the fun of improv team building games! 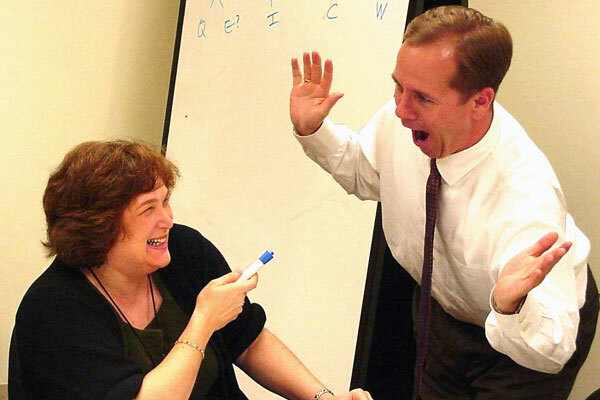 Does your team face risk, change, and uncertainty with dread…or excitement? Does support lessen or escalate when a colleague needs their help? Life isn’t rehearsed; it’s improvisation! How we handle the bumps in the road and the way they make us feel… that shouldn’t be left to chance. Welcome to TEAMprovising, the event where we play with how we cope with what comes next – anticipated or not! Challenge, fumble, and laugh your way through the cooperative fun and team sharing that are the backbone of our games. We’ll be maximizing our strengths and chuckling at our differences as we work through it together. You’re set for some entertaining learning with some seriously funny lessons! Note: The folks participating in this video were strikingly outgoing so we adjusted to that in our itinerary. If your team is less bold (or just takes longer to get there), exercises selected may be simpler, more verbal, or less physical. 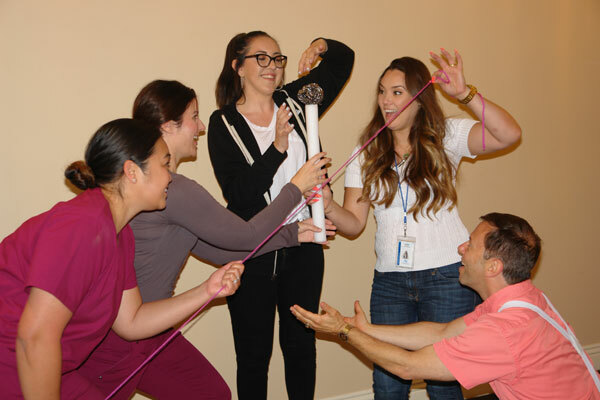 Each group is unique…and so is each improvisation team building session! Improv trains us to listen more closely, build on the thoughts of others, and identify body language signals. Get past the walls of status, age, education, and history. 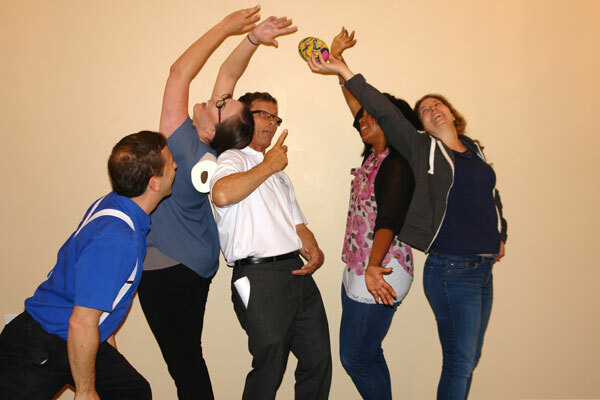 At TEAMprovising, the playing field is leveled as we’re trying something fresh, stimulating, and interactive. Once we see ourselves and each other in a new light, appreciating discovered talents, all kinds of new possibilities unfold. Teamwork skills are much more than about peers; we develop expertise in fostering all relationships, including clientele. We’ll open eyes to obstacles we can minimize, deepening loyalty and commitment. What are TEAMprovising’s “ABC’s of organizational success”? What are the 5 C’s of teamwork in TEAMprovising? What outcomes do you hear after TEAMprovising? Day by day, our co-workers are our second family. Most of us have as little choice in who they are as we had in our first family. And we have even LESS control about who we’re paired with for clients. If time and effort with our teammates and customers feels good, we’re more likely to give good-natured support to one another when asked. Within a tight second family, we’re likely to offer support before it is even requested. Data shows that we achieve better work in such an setting, use fewer sick and personal days, and reach higher client satisfaction. Staff who enjoy each other resolve conflicts better, avoiding the need for management intervention or even legal action. Staff who enjoy their team and their employer relationship hang up on headhunters and don’t float their resumes, saving you big bucks in lost knowledge, hiring effort, and re-training. These are the kind of feedback we’ve gotten about TEAMprovising since 2000. TEAMprovising is an investment in your team staying with you and working well together. 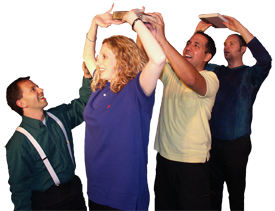 And unlike many other team building companies, whether they use improv or not, there’s no turnover here. For close to two decades, every TEAMprovising event at IMPROVentures has been led by Milo himself. Contact us to see to learn more about creating an event for you! What attendees think about the improv games.